Wednesday 28th October Paleo cooking class | Wholesomeness | The Grange Want to know how to make food prep healthier and easier? Book in for a healthy, paleo-friendly cooking class at Wholesomeness, where you’ll learn how to create nutritious meals from a healthy (and budget friendly) shopping list. With healthy smoothies, functional food snacks and quick and delicious dinners guaranteed to give you more energy but not take up all your time and money, you’ll be feeling more wholesome in no time. Thursday 29th October Jägermeister party | Bavarian Bier Café | CBD Step Oktoberfest up a notch at the Bavarian Bier Café’s Jägermeister Party on Thursday October 29. Flying Stags and Jäger shots will give you (or make you think you’ve got) the moves like Jäger when you dance the night away to the Haus DJ and live entertainment. 4 Pines brewery tasting | Riverbar & Kitchen | CBD Join the team at Riverbar & Kitchen on Thursday, October 29, from 6pm to celebrate the last day of their Craft Beer Month. The brewers behind the golden goodness that is 4 Pines Brewing Company will be attending and chatting about their brewery and brewing process for the keen beer enthusiasts of Brisbane. The night will be filled with beer tastings with matching nibbles and live entertainment by The Satellites, making for the perfect after work event! Friday 30th October Pop Up Soiree | Sofitel Brisbane Central | CBD Friday knock off drinks just got classier with the launch of Sofitel’s Pop Soiree bar for summer. Head up to their rooftop terrace on a Friday afternoon and you’ll find 180 degree city views, luscious cocktails and share plates matched with live DJs. Happening every Friday until December 18 from 3.30pm until 11pm, it’s the perfect spot for end of year catch ups. 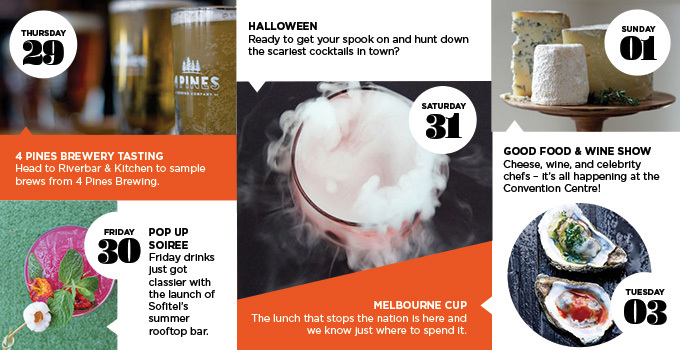 Saturday 31st October Halloween | Venues around town Ready to get your spook on and hunt down the scariest, creepiest, most ghoulish eats and drinks on offer for Halloween in Brisbane? Well you’re in luck, because we’ve compiled a list of the freakiest Halloween and Day of the Dead of dead happenings in town. Plan your hit list here. Sunday 1st November Good Food & Wine Show | Brisbane Convention Centre | South Brisbane Did you say wine appreciation? We’re there! Watch your favourite celebrity chefs create masterpieces live on stage at the Good Food & Wine Show at the Brisbane Convention Centre over 3 days. Headline acts of a different kind are in store for the show with appearances from George Calombaris and Adam Liaw from Masterchef. Walk in for the wine and leave with goodies and tips to create your own good food at home…it’s a win wine situation. Tuesday 3rd November Melbourne Cup | Venues around town Race? What race? As far as we’re concerned, Melbourne Cup is just another excuse to eat and drink to our heart’s content all afternoon long. And hay, who could blame us? From nibbles and bubbles to filly-fledged feasts, there’s plenty of Melbourne Cup luncheons and galas in Brisbane to choose from this year. Hedge your bets and make sure you spend the day at one of our top picks. Friday 6th November Royal Croquet Club | South Bank What does croquet have to do with food and booze? A whole lot if we’re talking about the Royal Croquet Club, a pop up festival and social club taking over South Bank’s Cultural Forecourt this month. Taking place from November 6-22, the summery event will see the likes of Miss Kay’s, Mighty Mighty, Sin Vida and plenty more dishing up street eats to pair with Pimms jugs and croquet. HeARTfelt Dinner | Aqua Linea Riverside Restaurant | Teneriffe Eating for a good cause? We’re in! Hosted by the RBWH Foundation, the HeARTfelt Dinner is a delightful evening to celebrate good food, wine and art, all in an effort to raise funds for the life-saving work of the Burns, Trauma and Critical Care Research Centre. Aqualinea will be putting on a delicious 3 course dinner paired with premium wines for the evening, with tickets $150pp and available here. Saturday 7th November 2-4-1 scoops | Lick! Ice Cream | Graceville You scream, I scream, we all go and get ice cream at Lick! Ice Cream’s brand new ice creamery! Brisbane’s favourite frozen dessert company is opening their first store in Graceville, and they’re celebrating with 2-for-1 ice scream scoops all weekend! Plenty of your favourite ice cream and sorbet flavours will be up for licking at the new store, including that infamous strawberry flavour. Eat in or take it away, just make sure you get there! Sunday 8th November Finders Keepers Market | Old Museum | Bowen Hills Losers weepers if you miss out on the keenly awaited Finders Keepers Markets! Set to be bigger and better than last season, the biannual event supports independent designers and stall holders with food trucks, art stalls, vintage wares, snacks, drinks, music and so much more. This time round it’s as much about the food as it is about the fedoras, with Fiori Bakehouse, Ugly Food & Co., Chip Tease and Mangia Mangia joining the foodie line up. Catch them on November 7 and 8.